The third and final film in Tom Schroeder’s 'Bike' animated documentary series. Two bikers travel 500 miles to ask a question about beer. 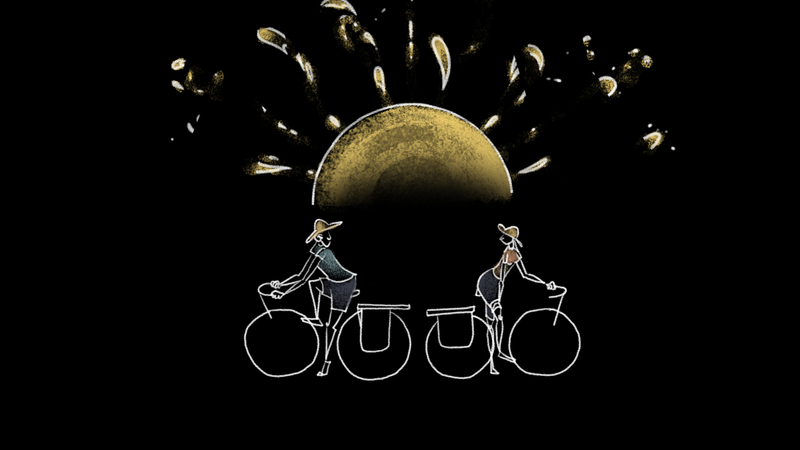 Slip on your lycra, grab your helmet and join us on a 500-mile bike ride through Midwest America in Tom Schroeder’s animated documentary Bike Trip. The third and final short in the his Bike series, this latest film follows Schroeder and Hilde de Roover on a journey from Minneapolis to Kalamazoo, as they look to answer one of life’s most important questions…about beer. Story – though each individual narrative is very different, they all orbit around bicycles and love. Style – all three shorts sport an aesthetic which revolves around white line animation on a black background. Soundtrack – the trilogy of films are all driven by a lively improvised percussion track from noted jazz drummer Dave King. While these common identifiers remain through all three films, it’s fair to say the technique and craft involved has somewhat evolved since the first film was made and with each film you notice differences (some subtle, some major) in production. The one thing that doesn’t seemed to have changed over the years though, is the importance of that soundtrack. Recording Dave King’s percussion response to the story in one-take, the improvised, unpredictable nature of the audio, seems key in Schroeder’s process. Though Schroeder has been making short films for 20+ years now, I only recently discovered his work with the wonderful Marcel, King of Tervuren. With a strong eye (or is it ear?) for a story and a distinct style, his work is truly charming, utterly engagement and impossible not to enjoy. It’s a proud moment for us here at Short of the Week that we get to premiere the final part of Tom’s Bike trilogy and we look forward to seeing what comes next from the talented filmmaker. “I’m working on an educational film from 1972 called The Birth Order Experiment, says Schroeder when discussing future projects. “It’s about a behavioral science study involving a jazz fusion band made of three young men who all come from families of three boys. It’s pastiche of this period and genre, but also a tribute to the educational film as a kind of folk art”.